Jaimie joined Whiting and Partners in July 2014 after completing her A-Levels in Mildenhall. 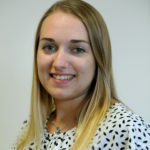 She has completed her AAT and ACA qualifications and manages a portfolio of corporate, audit and charity clients based in the Bury St Edmunds office. She is a member of the firms Audit, Not-For-Profit, and Corporate Tax groups. Jaimie also gets involved in the office charity fundraising and social calendar. When not at work, Jaimie enjoys cooking and crafting, and always has her hand in a DIY project.